Nothing makes customers unsubscribe and ignore emails faster than indifferent and uninformed spamming, but email personalization isn’t always the answer. It can be creepy when overdone -- think hyper-localization or incorrect demographic data. When it comes to email marketing, finding the middle ground between effectiveness and stalking is the sweet spot. Recent data suggests that more than 50% of people unsubscribe to email because content is irrelevant, too frequent, or both. 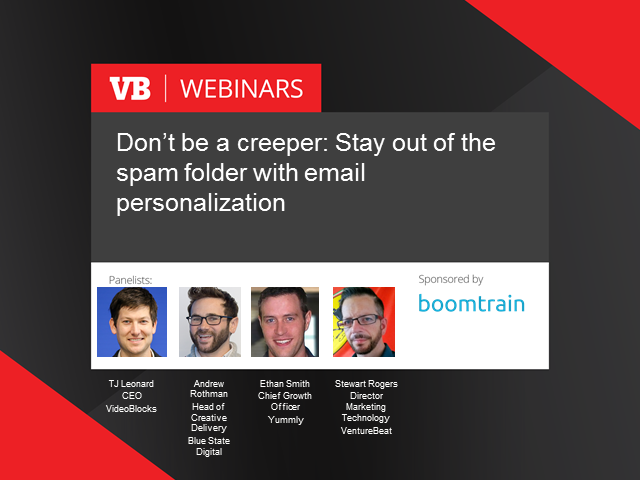 This webinar will help you build the right kind of personalized email marketing, without being a creeper. * Narrow down customer interests and respond with content that is actionable and useful. * Targeting the right data to appeal to customers' needs and desires. * Managing email frequency the right way. * Identify warning signs that you may have gotten a little too personal. Register today and keep your carefully crafted marketing emails out of the spam folder.